For painter Sean Worrall, the streets are the biggest gallery space of them all. The Hackney-based artist is mid-way through a guerrilla art project called #365ArtDrops, in which specially-made paintings are ‘dropped’ around the borough and beyond, for members of the public to take home and tweet about. Worrall plans to make and distribute 365 paintings in total during the course of this year. His rule is to use only found materials for the paintings, such as a piece of wood off the street, an unwanted canvas in a skip, or a piece of cardboard. 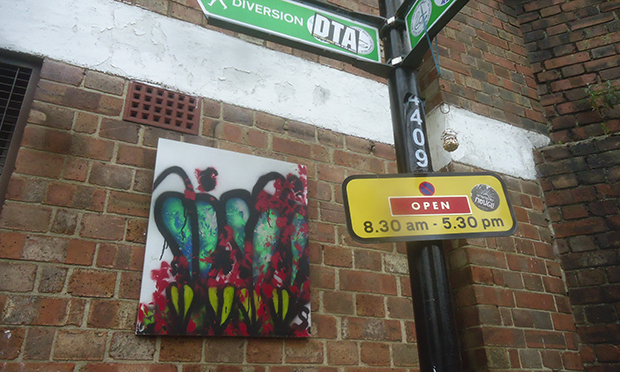 Each artwork is hung on the street in a carefully chosen location and labelled with the hashtag #ArtDrops365. Those who take the paintings are encouraged to use social media to document the project as it evolves. “People look up the hashtag and put photographs on Twitter of them, to tell me where they are or who they are, and where it’s got to. That’s really important because I want to document it all in the end,” says Worrall. USA, Israel and Germany are among the final destinations of the paintings, even though each one has been dropped in London so far. “I’ve got a great photo of a kid holding his ArtDrop by a sign in Oakland, California. 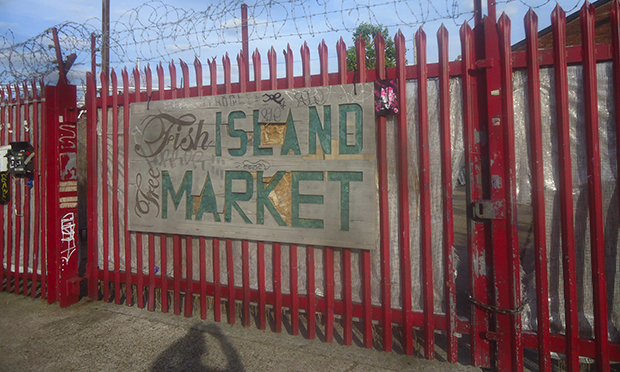 I left that one in Hackney,” says Worrall. 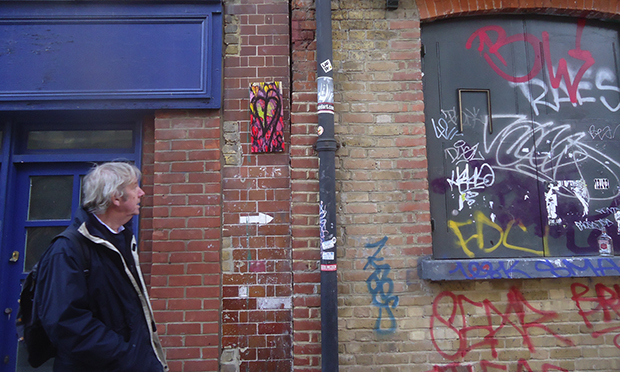 The distinctive pieces, each one bearing Worrall’s leaf-heart tag, have been left all over London: outside shops, inside pubs, under railway bridges, on railings and on the top deck of buses. Worrall spent three years running the Cultivate Vyner Street gallery, which closed last year and is now being developed into flats. With ArtDrops, however, Worrall making work outside the traditional gallery setting, that allows the public to form part of the creative process. He hopes that by the end of the year he will have enough feedback to fill a book.